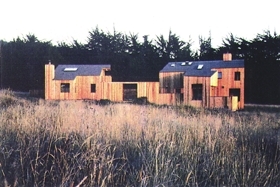 The most ingenious and delightful of all the “second generations” Sea Ranch houses is Lyndon/Buchanan Associates’ 1989 house and studio for artist Dianne McKenzie, in which the owner’s collaboration (and that of another Sea Ranch pioneer, builder Matt Sylvia) was as important as the architect’s design. Two separate buildings joined by an open walkway face one another across a stockade-fence open yard. To the northeast a barnlike, symmetrically disposed structure house the studio and “garage” (which is not used for cars). The studio contains a huge upright loom on which McKenzie weaves wall-sized works of fabric art; the garage has become her painting and metalwork studio. A row of kitchen appliances and a tiny bathroom were included in the “garage”, window seats and a wood burning stove in a sunken alcove off the studio, and a sleeping loft and office up under the roof peak; so the studio can be inhabited separately from the house itself. The house is freer and more adventurous than that of the studio, although a single pitch (starting low in the northern meadows and rising up high to catch the southern sun joins the two buildings visually. The house appears a striking piece of abstract redwood and glass sculpture from the meadow; a captivating puzzle of interlocking forms and pieces seen from within. 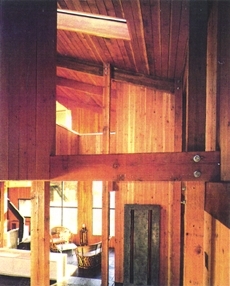 As in the celebrated 1965 MLTW condominium (Lyndon’s only previous residential design project at The Ranch), the doorless upstairs sleeping area is held aloft on rough, 6 x 6″ wood columns. A magical floating island, it sculpts and defies the vertical spaces between the bathroom area (which includes a dreamlike glass cube shower, visible to the whole house) and the bed-decked with its secret mediation alcove further along. Some of the open spaces in the house are fitted with see-through metal “impact panels”, miniature space frames originally made to hold insulation; they can serve as table tops, railings, or seats, and yet not interrupt the flow of space. Throughout the collaboration of artist, architect, and builder is visible in the ingenious and exciting mix of elegant (Indian slate) and industrial (rigid vinyl flooring) materials, the never ending play of light and space (behind columns, through the wire panels, around the floating floors, from high windows, and skylights), the Monet-like painting of certain walls, the superb joinery and decorative bolts-visible carpentry become art- the transformation of copper piping and salvaged truck parts into artful accents and fixtures: the wonderful “risk” of it all. The small, essentially one-room house- the perfect house for the perfect client-is surrounded by sheltered decks that almost double its livable space in good weather.